Jamaica: 1860-70 1/- in a black proof sheet (detail). 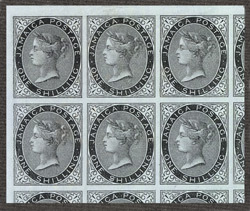 bl.uk > Online Gallery Home	> Online exhibitions	> Philatelic rarities	> Jamaica: 1860-70 1/- in a black proof sheet (detail). Shown is a proof in black of the 1/- value. The second stamp in the second row shows a small flaw in the printing plate, this is known as the “dollar variety”. The S in Shilling is malformed as a $ and can clearly be seen in this proof which is unique.